Hector Juan Samuel Torres was born on 7 October 1953, in New York City, USA, to Emma and Héctor of Cuban descent. He is a musician, artist, and entrepreneur, probably best known as the drummer/percussionist and songwriter of the rock band Bon Jovi. 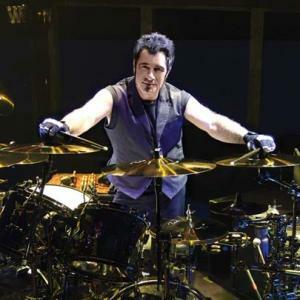 So just how loaded is Tico Torres? Sources state that Torres has established wealth of over $20 million, as of early 2017. His net worth has been accumulated during his music career, but also though his painting, and through his baby fashion business. Torres grew up in Woodbridge Township, New Jersey, along with his sister, where he attended John F. Kennedy Memorial High School. In the late ’60s he played drums for the psychedelic rock band Six Feet Under, and went on to play with artists such as Pat Benatar, Franke and the Knockouts, Cher, Chuck Berry and Alice Cooper, establishing himself as one of the premier players. He also played for the glam rock band T. Roth and Another Pretty Face. Then, while playing with the band Phantom’s Opera in the early ’80, Torres met bassist Alex John Such, who soon introduced him to singer Jon Bon Jovi, a rising star at the time. Bringing in pianist and keyboardist David Bryan and guitarist Richie Sambora, they formed the band Bon Jovi in 1983. Signing with Mercury Records, their debut self-titled album came out in 1984, with the song “Runaway” becoming an instant hit. Their second album, “7800° Fahrenheit” was released a year later, and extensive tours and various performances followed. Their popularity rapidly grew which earned Torres’ considerable money. In 1986, their album “Slippery When Wet” came out, achieving huge success, being named the top selling album of 1987, and including the later hit singles “You Give Love a Bad Name” and “Livin’ on a Prayer”. The album brought a few awards for the band too, boosting their popularity and their profits as well. Their next album, the 1988 “New Jersey” saw similar success, dominating the charts, and containing five Top 10 hits on the Billboard Hot 100. After a huge worldwide tour, the band went on hiatus, returning in 1992 with the double platinum album “Keep the Faith”. After two acclaimed albums came out in the ’90s, the band went on hiatus again. They reunited in 1999 and started working on their next album, the 2000 “Crush”. Its single “It’s My Life” became one of their biggest hits, which gathered them a younger fan base. After their 2002 album “Bounce”, they released a boxed set entitled “100,000,000 Bon Jovi Fans Can’t Be Wrong” in 2004, celebrating their 20th anniversary as well as the milestone of reputedly selling 100 million albums worldwide. Torres took lead vocals on the song “Only In My Dreams”. Several successful albums and tours followed. Their most recent album, “This House Is Not For Sale” came out in 2016. Aside from their 13 studio albums, the band has released six compilations and three live albums. They have conducted numerous tours around the world, selling over 130 million albums. This earned them a number of awards and honors, so being a member of such a powerful band has brought Torres astonishing popularity and significant wealth. Aside from playing drums and percussion, Torres has another talent. He is a self-made painter, exhibiting his art since the mid-’90s. His painting includes expressive images from everyday life as well as his life with Bon Jovi. In addition, he has launched a fashion line for babies called Rock Star Baby, which sells everything for babies from clothing, strollers, toys to furniture, and which has been another source of his net worth. In his personal life, Torres has been married three time, firstly to Sharon Torres (1983-85), then to model Eva Herzigová in 1996, but the couple divorced two years later. As of 2001 he has been married to Maria Alejandra, with whom he has one child. 1 Father of Hector Alexander (b. January 9 2004), with Maria Alejandra. 2 A common misconception is that he cannot sing. On the Bon Jovi box set "100,000,000 Bon Jovi Fans Can't Be Wrong" he sings lead vocals on a song and it is revealed that his voice is rough much like Louis Armstrong. 3 Enjoys golfing, horseback riding, sculpting, and painting. He said in an interview that he enjoys these things because he is "not old just older". 'Just Older' is the title of a Bon Jovi song. 4 Is the eldest member of Bon Jovi. He was thirty when he joined. 5 He has a pilot's licence.